BERLIN (Bloomberg) -- Volkswagen AG will likely resist union calls for 6 percent more pay for 100,000 western German workers as Europe's largest carmaker and the IG Metall labor union meet Wednesday for a first set of wage negotiations. “Our pay position is totally justified,” Uwe Stoffregen, spokesman for IG Metall's pay negotiator Hartmut Meine, said by telephone. “We'll go into the talks with a great level of self-confidence,” pointing to VW's sales gains. The German manufacturer sold a record 7.14 million cars and SUVs last year, a 14 percent increase from 2009. Sales chief Christian Klingler said Jan. 10 deliveries worldwide may increase another 5 percent this year. 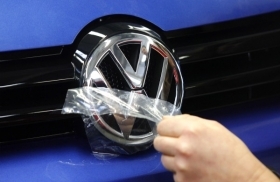 VW plans to invest 51.6 billion euros ($70 billion) in the automotive business through 2015 to help reach a goal of surpassing Toyota Motor Corp. in sales and profit. The company plans to create 50,000 jobs globally by 2015, with around 10 percent of the new positions in Germany. VW wants pay increases to follow a 2.7 percent raise for engineering workers agreed in February 2009. Planned job openings in Germany require the automaker being able to improve its competitiveness, VW personnel chief Horst Neumann has said, expressing opposition to a 6 percent pay increase. Company spokesman Stefan Ohletz couldn't immediately be reached for comment. Stoffregen said IG Metall doesn't expect VW to propose a pay offer in today's talks. IG Metall is legally banned from calling strikes at VW's six western German factories until Feb. 28 when a four-week cooling off period expires. Besides 95,000 manufacturing workers, the union is also negotiating pay for 5,000 staff at the carmaker's financial services division. Employees at a plant in Osnabrueck aren't affected by the talks. The current 18-month contract, which earned workers a 4.2 percent increase, plus one-off payments, expires Jan. 31. The new agreement should be limited to 12 months, IG Metall said. VW's global workforce at the end of the third quarter was 389,700, an increase of 6 percent from the previous year.